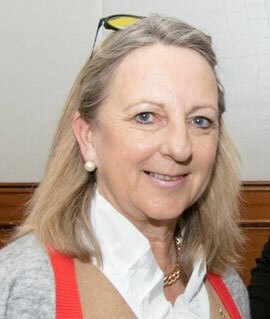 You may not be aware that Ski2Freedom has and is run by just Catherine Cosby, the Founder and Trustee so we have no paid employees and all funds raised go direct to ensuring our Portfolio of Information is as comprehensive as possible and that Catherine can give the best advice and support. We also use donations to support the provision of specialist ski equipment. Luckily we have had the odd periods of help by individuals for certain projects such as the website. "Although I would not presume to understand all the difficulties faced by many of our beneficiaries, I do empathise enormously as I also have a daughter with Rett Syndrome and know as an independent wife and mother of a child with severe disabilities that life is never easy, either physically or mentally. I recognised that the holistic benefits the mountains could deliver and that, for many, the freedom to rehabilitation, respite and rejuvenation was often due to a lack of knowledge and information. Ski 2 Freedom evolved because there was no resource available that responded to the specific needs of children and adults who could benefit from participation in mountain activities once thought to have been out of reach. It is now very much leading the way in how life-changing activities can benefit everyone and that tourism for health should be inclusive and accessible. I always do my best to make sure that the experience beneficiaries have is as wonderful as possible. I am enormously grateful for all the support that I and the Foundation receives and we really are a global organisation with enquiries coming in from as far away as Uraguay, Australia, Japan, the Middle East and Asia – thank you everyone!" A longtime supporter and advisor to Ski 2 Freedom, we are delighted to have Gustave-Alain as Honorary Director of our Fundraising initiatives. He was instrumental in obtaining the most generous donation of 1,000,000 Swedish Krona along with other generous donations. He also takes a personal interest in our work and when we held our first Tobell Family Fund – Making Dreams Come True in Wengen March 2015, he was there to help out and experience first-hand the empowering benefits of winter activities. Ensuring a high level of profile for our website and Information Resource is a key element to fulfilling our mission. Ed has been involved with Ski 2 Freedom almost since its conception and has undertaken work at a considerable discount and on a voluntary basis. His interest in film and photographer is used to produce some of our Ski 2 TV clips. His personal involvement in disabled skiing is gained by accompanying a paraplegic friend on many trips to the mountains (Tude) and the development and promotion of summer mountain bike activities. 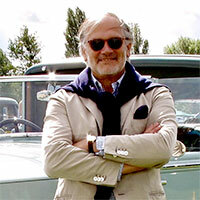 Ed is now based in Chamonix with his company EN Design & Development. Ski 2 Freedom Foundation also has a Strategic Planning Group which helps with advice and strategy both for our day-to-day work and future projects. No-one can presume to know everything, and we are delighted that we have key organisations, professionals and beneficiaries who are happy to give their advice and, importantly pass on their own experiences to help us follow through with our mission. 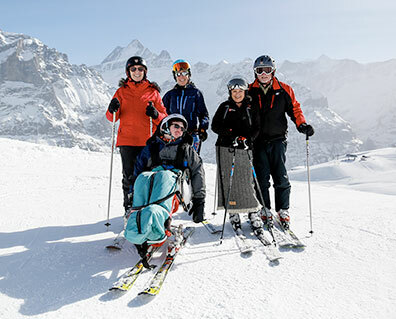 Ensuring that we meet the needs of all those whose lives can be enhanced by participating in mountain adaptive activities - both sport and leisure - we do make use of an ever increasing network of people in the world of mountain adaptive and assisted sports; tourism; hospitality; travel; medical profession and associated organisations. George was with us from the very beginning and we owe him an enormous debt of gratitude. Sadly George passed away in 2016 and is still much missed. Maggie was truly inspirational as a Trustee and gave up much of her time to help support our work through her own experiences. 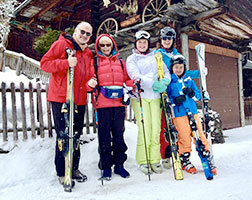 Many of the young people who went on a Silver Lining and CCMS ski trips to La Plagne benefited from our portfolio of information and equipment donated by the Tobell Family. Tim was a great Trustee who brought so much to our work as he himself was a Paralympic winter skier. He continues to point friends and members of BackUp Trust so we can help them achieve life-changing times on the snow. Tim left us to set up his own Access Adventures and we are happy to help raise awareness of his work.